The Albero Ensemble are a vivacious, young and talented group of musicians, who pride themselves on their professionalism and musical excellence. The quartet members are all scholars of either the Royal College of Music or the Royal Academy. They perform in many capacities; for concerts, recordings and background functions and are available to hire as a Duo, Trio and Quartet. The Albero Ensemble has given recitals at numerous prestigious London venues, including St James Piccadilly, St Martin in the Fields and the National Gallery. In addition, they have recorded for many film composers and have been used to create a documentary soundtrack for Channel 4. The group has also enjoyed television appearances on BBC 1, More4 and the History Channel. 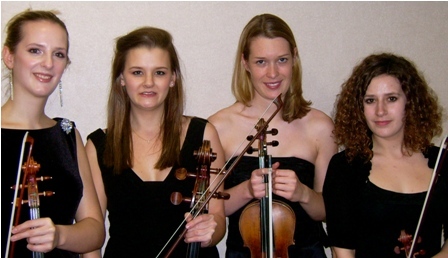 Each variation of the ensemble (Albero Quartet, Trio and Duo) has an extensive repertoire and members of the group are very happy to tailor their programmes and accommodate special musical requests where possible. The group has extensive experience in background music functions, playing at high profile events attended by the Queen, Prince William and numerous celebrities. Past venues for weddings and corporate functions include Clarendon House, Alexandra Palace, HMS Belfast, Wallace Collection, Kensington Palace, Kensington Orangery, Claridges, Chelsea Football Club, Tottenham Hotspur Football Club, Boodles, Syon House, the RAC Club and the Pall Mall Club. Of particular note, the ensemble was selected to play for the prestigious opening of the Royal Courts of Justice in Parliament Square. They were also employed to play at the openings of the Rothko Exhibition (Tate Modern) and Darwin Exhibition (Natural History Museum). Whatever the occasion, they recognise that every event is unique and requires assiduous and personalised planning. They are very happy to work closely with clients, making recommendations concerning repertoire where requested, and taking their requirements into account so that expectations can always be exceeded. The Albero Ensemble delivers a consistently superb entertainment package, characterised by its exceptional levels of musicianship and dedication to satisfying its clients’ needs. The Albero Ensemble is the perfect addition to any event. Please do not hesitate to ask for a no obligation quote. *Modest travel may be added if the venue is outside London, but we will work with you to keep these costs as low as possible.